If there were ever a time to say “Fork it!” and go for a ride it would have to be after leaving your job and ending your seven year marriage. While most of us would go for a weekend or maybe week long trip, Allan Karl (alias World Rider) sold everything he owned and took his ride 60,000 miles further. He spent the next three years travelling across the world on his motorcycle. 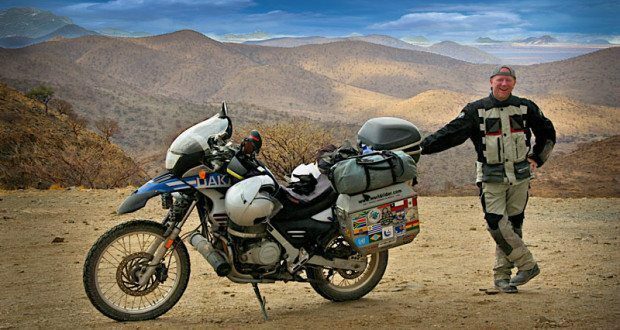 He visited 35 different countries over 5 continents on his BMW F650 GS Dakar. 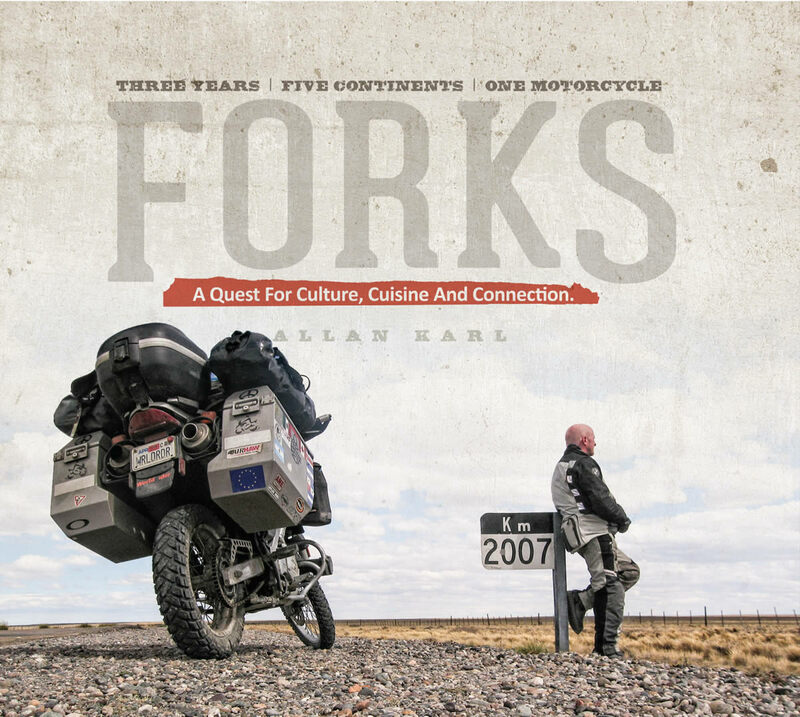 When Allan returned home from his little trip he wrote a book about it, titled FORKS: A Quest for Culture, Cuisine, and Connection – no big deal, right? We had a little virtual sit-down with Allan before the holidays and asked him a few questions about his experience around-the-world motorcycle ride, his book, and his experiences. 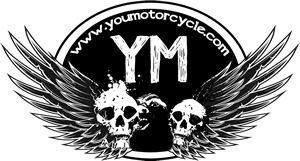 YouMotorcycle: We might have been acting a bit facetious in calling your three year, 35 country, around the world motorcycle ride a little trip. That’s a helluva lot of miles. What were some of your favorite parts of the adventure? Allan Karl: First, I’d have to say one of the best parts of my trip was meeting people; most who went out of their way to help me, feed me or share with me parts of their country that many travelers might miss. Second, I found that regardless of the two years of planning I did in preparing for my trip, I found the most rewarding parts when I learned something new and then changed my plans and discovered something different. Finally, people often ask what were my favorite countries. This is an impossible task, but I must admit that I was taken my Argentina for it’s unique blend of Latin and European culture and for its geographic and climatic diversity. I liked Ethiopia for its rich culture perhaps as a result of being perhaps the only country in Africa that was never colonized. And then there is Syria. I was taken back by the kindness of strangers, the history and the food. It brings tears to my eyes to see what’s happening there now. YouMotorcycle: You have twenty seconds to give us five reasons why we need to read FORKS: A Quest for Culture, Cuisine, and Connection. Go! The book is a tome and allows readers to explore much of the world: they can see it through the more than 700 photos; they can feel it through stories of adventure, culture and connection through my stories; and they can taste it through the flavors of food with recipes from each of the countries I visited. The photography — especially of the people. The stories — one from each of the 35 countries I traveled. It’s a great coffee table book — flipping through the pages will bring out the wonder and curiosity of everyone—whether they ride or not. YouMotorcycle: You beat the clock, nice! How’s about that BMW F650 GS Dakar… did it make it in one piece? Allan Karl: The BMW motorcycle was in pretty good shape, despite the nearly 65,000 miles on it. It certainly shown signs of wear and broken parts: the left-hand grip wore down nearly to the bar and the right side mirror cracked after falling off the bike in Ethiopia. But it ran fine. And though A GS doesn’t need to look pretty, I think they should. Rather they look better with a little war scars. As I traveled from Washington DC across the country is in the back roads to California, the only problem I had — and the first time ever— I was in a dry county in North Carolina when my rear wheel seized, seems the bearings and just given up and got so hot nearly welded itself to the chase on the wheel — so I got to spend the night in a dry countyin North Carolina to solve that minor problem. From there it was smooth sailing back to California. YouMotorcycle: Scary stuff. Any other stories or memories that you’d like to add, or is there another anecdote from your adventures that you’d like to share? Allan Karl: Two things. First, in Sudan after I dropped my motorcycle in the sand for the umpteenth time, the nomadic nubians with camels who helped me lift it each time finally suggested, with tongue in cheek, “Maybe Mr. Allan, you need camel instead of motorcycle.” Second, those people who have so little are willing to give so much. Thanks Allan! The book is beautiful and full of colors, stories, and recipes. It’s 270 pages, hardcover, and measures 9″ x 10″. 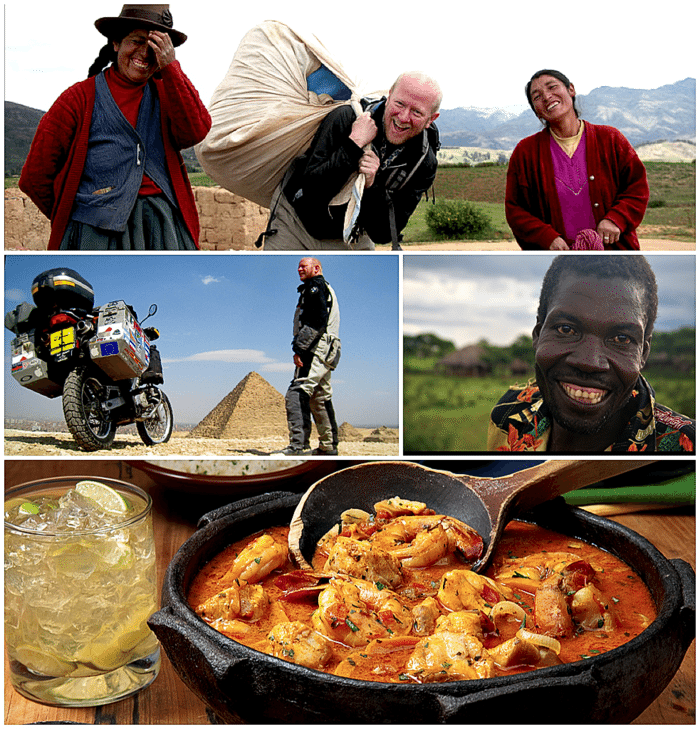 There are over 40 recipes and countless impressions of faces and stories from all parts of the world. Learn more about FORKS: A Quest for Culture, Cuisine, and Connection on the book’s website. Visit Allan Karl’s website WorldRider.com. Buy the book on Amazon as a gift or just to spoil yourself with something that might just open your eyes, and your appetite.